Ready to reduce staffing disruption risk and save tracking time? The patent pending QC-Track.Credentials module is designed for the unique tracking requirements of diagnostic imaging. NEW: QC-Track.Credentials now has three options of credential tracking: Standard, Enhanced, and Specialty. QC-Track.Credentials - Standard tracks periodic training, certification, and reviews such as those established by department managers and Radiation Safety Officers. This option meets general imaging tracking needs, like The Joint Commission’s new training requirement that all fluoroscopy staff undergo and document ongoing education. Features include reminder schedules, credential reports, and the ability to attach PDF copies of certifications. A new feature allows links to online training to be included in the email reminder to make it easier for employees to stay current. QC-Track.Credentials - Enhanced includes all of the capabilities of the Standard offering and adds detailed tracking for CEU/CME and exam count by modality. 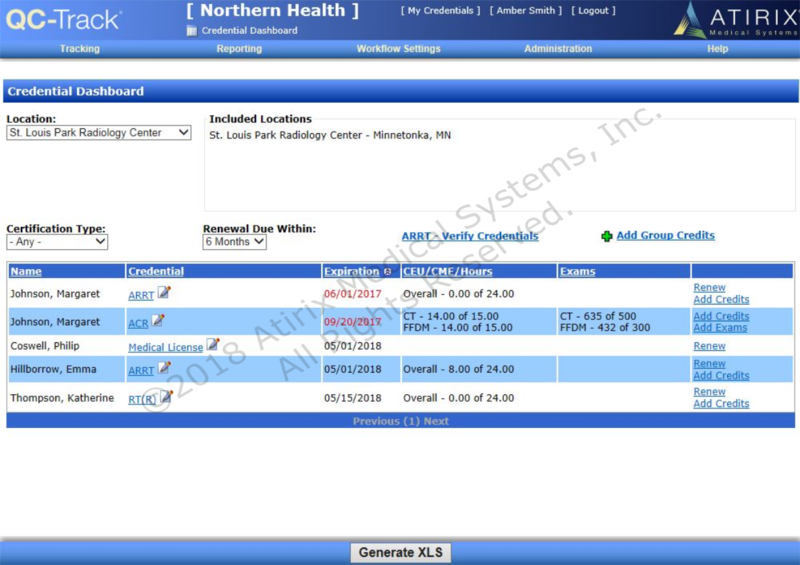 The point-in-time and rolling window tracking features simplify compliance with the ACR’s continuing education requirement and automatically identify and notify personnel of expiring credentials. QC-Track.Credentials - Specialty is a comprehensive credential tracking solution that builds on the Enhanced offering to meet all of the needs specific to a modality. The initial offering is Specialty for Mammography™ for FDA EQUIP. Specialty for Mammography adds support for the process requirements of FDA EQUIP Questions 1 and 2 and the ability to schedule and track device and location events through the QC-Track®.Planner™ module. See the chart at the bottom of this page for benefits and features of each of the three options. For RTs and IPs being tracked in the QC-Track.Credentials module, two workflows are available to support the Image QA tracking needs of FDA EQUIP and MQSA facilities. For EQUIP Question 1, Image Feedback, a workflow in the Image Feedback tab is used to track feedback between the IP and the RT. An email is sent to the RT when feedback is logged. Corrective Actions can be logged and tracked. For EQUIP Question 2, Image Review, a workflow in the Image Review tab is used to track the periodic IP and RT image reviews. Corrective Actions can be logged and tracked. For EQUIP Question 3, Sign Off, a workflow in the QC Reports module allows LIPs to perform paperless QA/QC review and electronic sign off. For more information on how QC-Track meets your EQUIP needs, view our infographic or see our FDA EQUIP web page. The QC-Track.Credentials module is an optional add-on to the QC-Track Base Platform. Credentials are licensed by the number of clinical professionals being tracked. Professionals being tracked are not required to be QC-Track users. With three options for credential tracking, you can select which level of QC-Track.Credentials best meets the needs of individuals or departments. Have professionals who store documents as proof of annual training? Use the Standard level option for that. Have departments with more complex requirements for continuing education and exam counts by modality? That’s a tracking task for Enhanced. Have a mammography department that follows the FDA EQUIP guidelines? Specialty for Mammography provides you what you need. 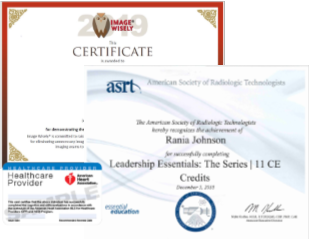 Pick the level that works for you: Standard, Enhanced, Specialty for Mammography or a combination of all three to bring the benefits of paperless credential tracking to your entire imaging team.